Frivolous Friday: What Makes a Game Fun? What makes a game fun for you? I was in Austin last weekend (thanks again for the invite, Atheist Community of Austin! ), staying with Russell and Lynnea Glasser. We spent a lot of time talking about games, what games we do and don’t like, what makes a game fun or not-fun for us. (We also played an awesome game of Slash. *) And I’ve been thinking about what qualities I look for in a game. 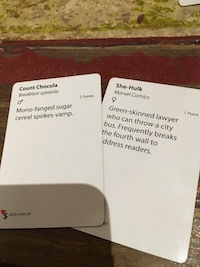 A winning hand in Slash, the fanfic/ ‘shipping game, in which Count Chocula is romantically paired with She-Hulk. I like games that aren’t particularly competitive. I like games like Slash, Fluxx, Apples to Apples, or Snake Oil, where you can theoretically keep track of who’s winning but nobody really does and it’s not the point. There are exceptions — I’m very fond of Ingenious, which is quite competitive and even a bit cutthroat — but they’re rare. I don’t like games where you have to count cards or remember what’s been played. I want to be able to figure out what to do based on what’s on the table, now. And I like games that don’t take too long to learn, and don’t take too long to play. Again, there are exceptions — I’m very fond of Chrononauts, a time-travel game that took me ages to figure out what I was even doing — but they’re rare. For games I play on my phone or other devices, my criteria are very different. 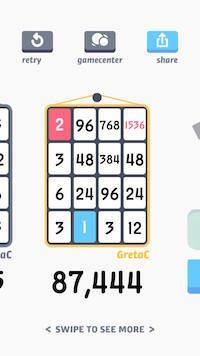 I have one large, deal-breaker qualification: I want my device games to be solo. I DO NOT want them to be multi-player or social. There’s a joke I often make about this: The whole reason I play phone games is that hell is other people. I obviously don’t think that (mostly), but I am very introverted, and I’m getting more so as I get older. I find human interaction with anyone other than my closest friends to be valuable but ultimately tiring. One of the main reasons I play games on my phone is to create a mental space I can withdraw in for a while. My go-to phone games are Threes, Wordament, and Klondike solitaire (the classic solitaire card game, with seven columns and building on aces and putting black tens on red Jacks). Wordament is pushing it, since you’re playing the same word-search grid with hundreds of people at the same time, and you’re scored against them as well as getting an absolute score. But the basic game mechanic is solo, and you can ignore your rankings if you want. And while you are scored against other people, you don’t actually, you know, interact with them. I also want my device games to not take very long. I often play them when I’m killing time waiting for things (like waiting in line for coffee), when I’m taking a break from work, or when I’m getting ready to go to sleep. I don’t want to have to stop a game and re-start it and remember where I left off, just because my coffee order is up. I don’t, however, much care about having a clear “win.” In fact, until I was talking with Russell, it hadn’t occurred to me that this might be a preference for game players. I was showing Russell Threes, a game I’m completely obsessed with, and we had a brief but interesting communication breakdown when he was asking what the goal of the game was. I kept explaining that the goal was to get lots of high numbers, and he kept asking “But what’s the goal?” — and we finally realized that he was asking how you win the game, and I couldn’t answer, because there is no winning. You try to get the highest score you can before you lose. If you care about winning, you have to define what a “win” means for yourself. (For me, an acceptable outcome is when I get a 384 tile, a good one is when I get a 768, an awesome one is when I get a 1536 — and of course, an extraordinary one is when I beat my previous high score.) It hadn’t occurred to me until this conversation that having a clear win condition might be something game players might want, and might even be a dealbreaker. And I realize this may be an unpopular opinion, but I’m going to say it anyway: For reasons I can’t fully articulate, I hate, hate, HATE Tetris. I can see the appeal, but playing it makes me anxious, frustrated, and actually angry. So what makes a game fun for you? And what makes it not fun? What are your preferences — and your deal=breakers? *I still think Rosebud the Sled would have made a better pairing for Bella Swan. Stiff, wooden, not very original, but somehow the object of obsession of someone far more interesting — these two are made for each other. Frivolous Fridays are the Orbit bloggers’ excuse to post about fun things we care about that may not have serious implications for atheism or social justice. Any day is a good day to write about whatever the heck we’re interested in (hey, we put “culture” in our tagline for a reason), but we sometimes have a hard time giving ourselves permission to do that. This is our way of encouraging each other to take a break from serious topics and have some fun. Check out what some of the other Orbiters are doing! I like strategy games, which are by nature competitive. But I find that there’s a difference between a game with head-to-head competition, and a game which merely has winners and losers. I like a game where players build their own thing, and the winner is the one who builds best–both winners and losers get to have fun building. In contrast, games like Chess make me feel bad about losing or winning. I’ve played Slash, but I didn’t like coming up with stories. Any sort of role-playing really doesn’t work for me. I admire the design of Apples to Apples because it’s a game about words and ideas but never puts anyone on the spot to come up with them. I’ve found that if I’m going out to see people I like, I don’t particularly want to deal with being competitive. Good cooperative games are hard to find, but I’ll take a game of Pandemic or Forbidden Island over anything where I have to beat somebody else. There is an exception; pull out Settlers of Catan, and I’ll just play because it’s fun. I tend to like board games that are reasonably competitive, but where they’re at least fun all the way through – and reasonably short. Like, 7 Wonders, Ticket to Ride: Europe, etc. I might not do particularly great in one of those games, might even be at the bottom score-wise – but you’re at least getting some points. I’ve introduced my girlfriend to board games in the last year, and she’s definitely preferring co-op games, like Pandemic, Hanabi, Sherlock Holmes: Consulting Detective, etc. Pandemic tends to stress me out, though – because there’s this big looming *lose* condition, plus the acceleration of the disease spread. Oooh games. This is where I’m a viking! Sometimes literally. So what makes a fun game? Agency for one thing. As a parent of young American kids, I’ve played enough games of Candyland or Chutes and Ladders (never actually bought them… but grandparents exist for some reason,) to realize that a game that doesn’t give you any control beyond rolling the dice is no fun, and all kids should grow out of them as fast as possible. A good game should provide an environment where the player makes interesting decisions that effect the flow of play or the enjoyment of the other players. Even games like Slash or Apples to Apples or CAH that can be played almost completely non competitively still give every player an opportunity to contribute to the fun each time around. I really like complex procedural games like Agricola or LeHavre or Puerto Rico, especially if there is an iOS version for the iPad, which is an amazing device for the purpose. Even if I lose one of these games the process is interesting and I can admire the strategy of my opponents. So give your players interesting decisions to make… that’s the heart of any good game. Can’t wait to play Slash at Skepticon again! I love love love puzzle and pattern finding games. 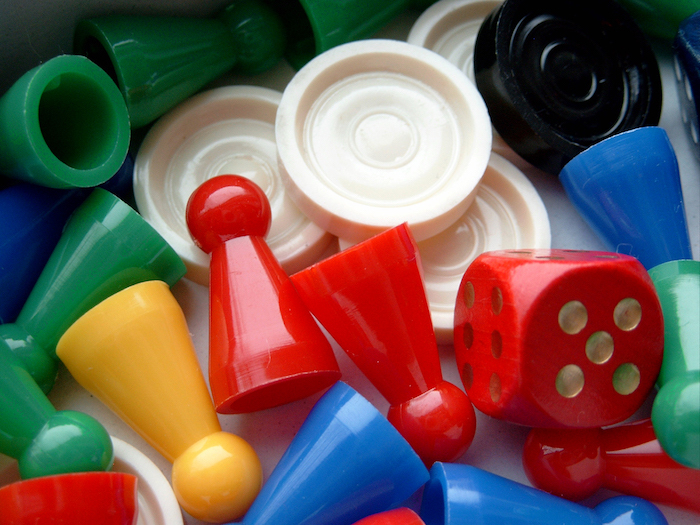 I’ll often lobby for Set, Tsuro or Triominos when digging through the game cabinet. My husband prefers hard strategy games like chess and risk. Our more complicated games get less use, because the set-up someone’s takes longer than the actual gameplay. You know what always is a good party game though? Jenga. Fits your criteria of drop-in gaming, mine of puzzle solving, and lets the strategic players size up the meanest move to pull on the next player. I’m old enough that I’m pre-D&D so there weren’t any board games with role-playing, so I don’t much like them now. I particularly like card games like Spite & Malice, Phase 10 or Crazy Rummy (a house game descended from a Minnesota version of rummy), which are complicated enough to be interesting but are fun to play. Yes, there’s a winner but it’s not particularly important; the game is the fun. I don’t mind non-story board games like Ticket to Ride but it doesn’t have the intellectual/strategy challenge a good card game has. I play a lot of Klondike Solitaire but nothing online. Mostly, it’s the hanging out with friends and playing for fun. Also, I like classic Mah Jongg (not the American version). 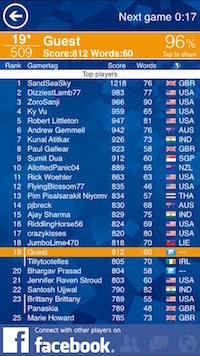 In terms of non-competitive games, Pandemic is a great one. It’s co-operative, so all the players are a team competing against the game itself. Since you’re acting as a team, if someone needs to step away for any reason it’s easy enough for the other players to take over their duties until they return. Admittedly, you can’t really fit new players in once the game’s started, so that’s a downside. On the other hand, since the game involves a lot of strategy and decision making, new joiners could still get involved by helping other players even if they don’t have their own pieces. It’s worth checking out.